This breathtaking photo shows the intense orange beam of a new 22-watt laser pointed at the planet Saturn. Wait, isn’t this like the shocking scene in Star Wars where the Death Star’s superlaser completely annihilated planet Alderaan? Thankfully humankind has not evolved (yet) to the level where we can destroy entire planets with the help of laser turrets. 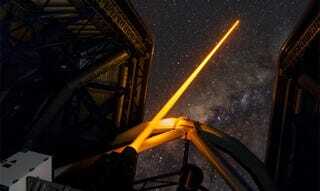 This laser beam is emitting from the Unit Telescope 4 at European Southern Observatory’s Very Large Telescope at Paranal, Chile. It’s the first of four so-called “laser guide star units” of the future 4 Laser Guide Star Facility (4LGSF), which will help astronomers to get much sharper images of deep space objects. The Adaptive Optics Facility uses sensors to analyse the atmospheric turbulence and a deformable mirror integrated in the telescope to correct for the image distortions caused by the atmosphere. But several bright point-like stars needs to be at hand in order to correct for the effects of turbulence, and these need to be very close to the science target in the sky. Finding multiple natural stars for this role is unlikely. So, to make correcting for the atmospheric turbulence possible everywhere in the sky, for all possible science targets, powerful laser beams are projected into the sky. When the beams interact with the sodium layer high in the atmosphere they create artificial stars. By measuring the atmospherically induced motions and distortions of these artificial stars, and making minute adjustments to the deformable secondary mirror, the telescope can produce images with much greater sharpness than is possible without adaptive optics. When completed in 2016, the Adaptive Optics Facility will see the UT4 telescope become a fully adaptive telescope providing turbulence-corrected images for all its instruments, without the addition of adaptive modules and supplementary optics. You can witness the illumination of the first laser unit in the amazing photoset below, and maybe hear the Imperial March tune playing softly in the distance.